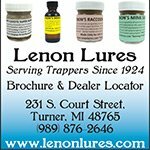 Although mink can seem elusive at times, there are a few mink trapping techniques you can use to dramatically increase your success on the trapline. Just about every new trapper begins by targeting muskrats in a local marsh or swamp because they're plentiful, easy to locate and easy to trap. Then as your skills progress, raccoons are typically your next target for a lot of the same reasons. After becoming comfortable with a few basic muskrat and raccoon sets, most trappers turn towards a more elusive and profitable furbearer, the mink. Mink have beautiful, luxurious fur that is always in high demand. However, for many trappers they're difficult to catch because they don't leave behind obvious sign. They don't build easy to find dens like a muskrat, or leave behind deep tracks in the mud or noticeable droppings like raccoons, so locating a spot to place a mink set can often seem like a guessing game. The key to becoming a successful mink trapper is understanding the animal, their habitat and how they travel as they search for food. 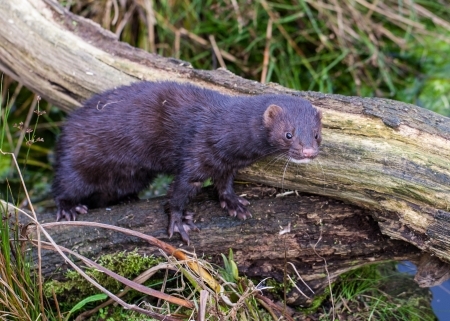 Here's the good news, once you know what to look for trapping a mink is actually pretty easy! Mink have long slender bodies that allow them to sneak and squirm through tunnels, log jams, holes and brush as they search for food. 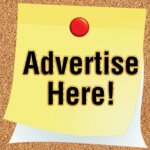 Since mink love to hunt and eat muskrats, you'll typically find a lot of mink in the same areas you're targeting muskrats. Although they spend a lot of time near the water, mink also spend a lot of time on land, often traveling large distances in search of food. So, unlike a muskrat that may visit your traps on a daily basis, you'll have to be a little more patient for mink. Many times you'll trap a few muskrats in a set, then after a few days you'll connect with a nice mink. One of my favorite blind sets for a mink is the bottom edge set. The set works great for muskrats and it's also very effective on mink. Mink love to swim along the edge of a stream as they travel and search for food. To make a bottom edge set, look for an area along a shallow stream where the outside edge of the water meets a steep vertical bank. Look for a spot where the water meets the vertical edge of the bank and tall grass helps hide the mink as it travels. 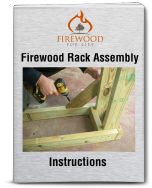 This is usually a great spot to make a bottom edge set. Once you find a good location place a 110 conibear, or to cover more area use a 160 conibear in this natural area along the edge of the bank that's created by the flowing water. A point or peninsula that sticks out into the water is a great location to make a bottom edge set. The bottom edge set is a blind set meaning you don't need to use any bait or lure, you're simply taking advantage of the minks natural travel pattern as they swim along the bank searching for food. Set the 110 or 160 conibear right on the bottom of the stream bed (thus giving the sets "bottom edge" name). The mink will be swimming underwater right along the bottom as they travel in search of food. You can use a few small sticks for blocking to ensure the mink stays tight to the bank and doesn't swim around your trap, but this typically isn't necessary. You can also place a dive stick above the trap to make sure the mink swims down into the trap, but again this typically isn't necessary since the mink is already naturally swimming tight to the bank and underwater along the bottom edge of the stream bed. Generally a well placed bottom edge set will connect with a few muskrats at first which is one of the best things about mink trapping because both animals travel in a lot of the same locations! When making any set (even when using body grip traps like the 110 conibear), always securely fasten your trap to make sure you don't loose a mink to poor trap fastening techniques. I like to fasten the trap using 11 gauge wire attached firmly to a nearby tree if the location allows or to a stake. 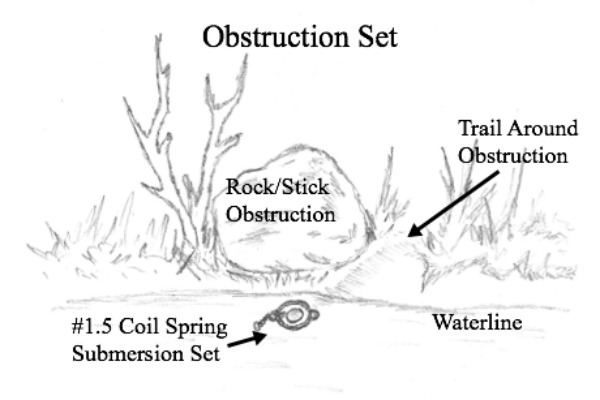 The obstruction set is another variation of a blind set where you utilize a natural obstruction such as a rock, root system or log that forces the mink into a pinch point within the water. Raccoons and mink like to enter the water in the same spot when they encounter an obstruction on land. This usually makes a well established trail heading into the water, so the animal can use the water to walk around the obstruction. Look for an area in shallow water where you can bed a foothold trap. My favorite foothold trap for mink is the #1.5 coil spring trap. The traps are easy to conceal, they're fast and powerful, and they're heavy enough to quickly drown the mink when used in a submersion setup. Plus, since there's a good opportunity you'll connect with a raccoon using this set, the #1.5 coil spring allows enough power to for a raccoon as well. 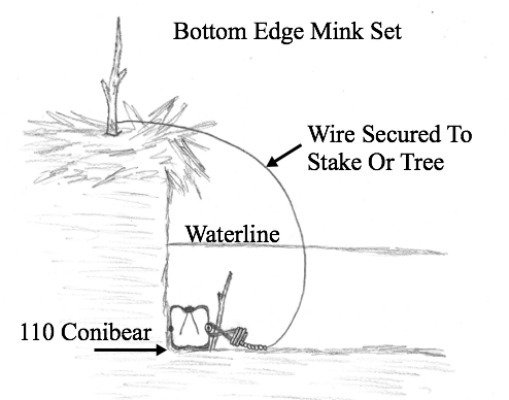 Although there are many sets that will work for trapping mink, the bottom edge set and obstruction set are both very productive blind sets to add to your trapline. 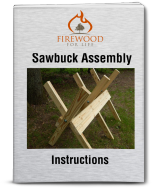 The sets are quick and easy to make, plus they also give you the opportunity to trap the occasional muskrat or raccoon depending on which set you use.